Here are some pictures of my trip from Portage La Prairie, Manitoba to Churchill and return! Even though we did not see any polar bears, it was still a great trip, and it was my first time in a "real" sleeping car, on a train complete with F9A's and steam heated passenger cars. We flew into Minneapolis/St. Paul, rented a car, and then headed north to Duluth. 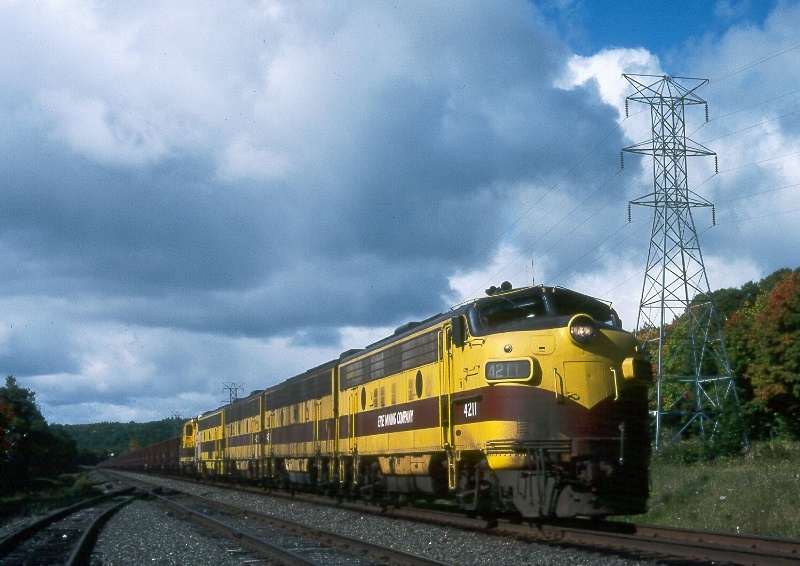 Here is a southbound DM&IR train at Zim on Sept. 16, 1995. 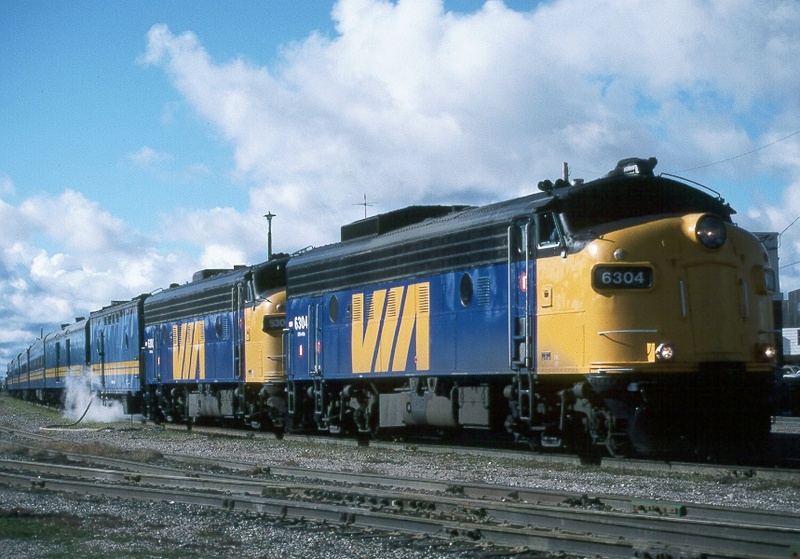 This set of DM&IR power was just getting ready to head south from the Thunderbird Mine at Forbes on Sept. 16, 1995. Just great lighting! 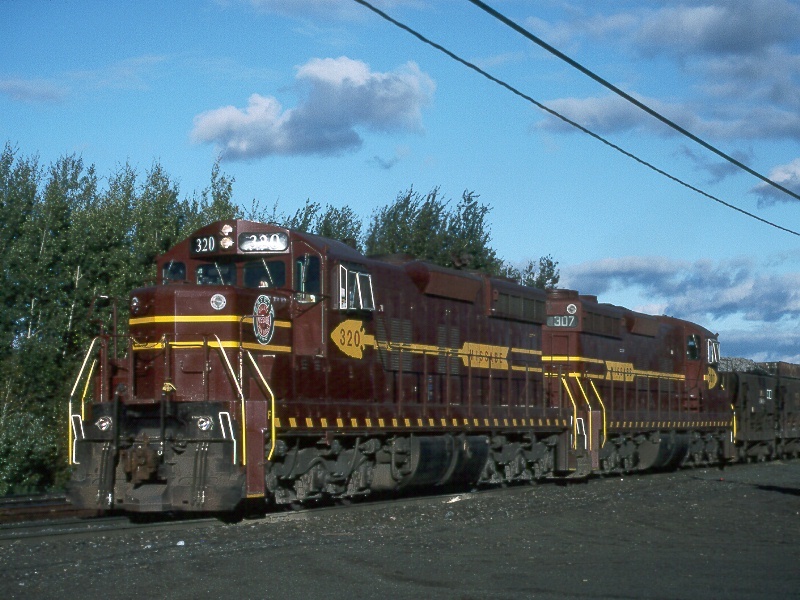 Then we headed north into Ontario and got this CPR engine switching at Kenora on Sept. 17, 1995. 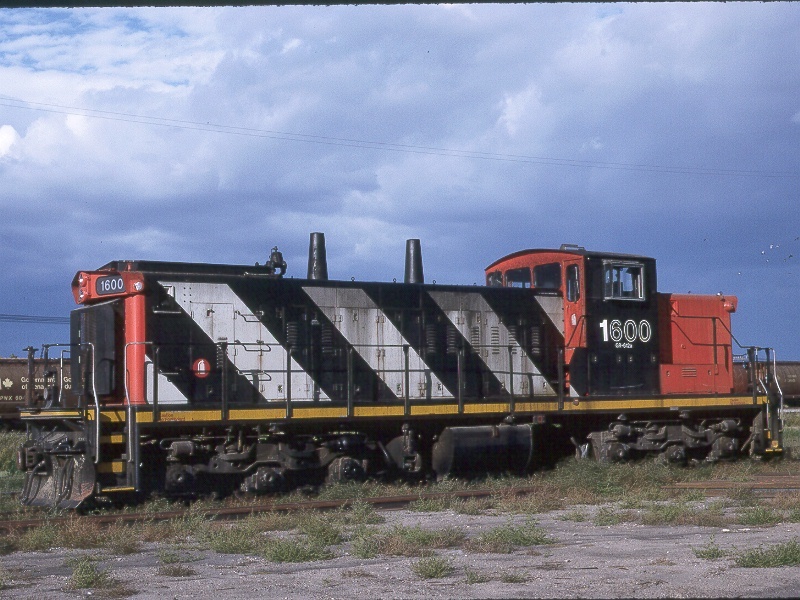 Later that day we arrived at Portage La Prairie, Manitoba and got this GMD1 still with the 6 wheel trucks. Note my friend running over to the unit to get shots of it as the sun came out from behind some dark clouds! 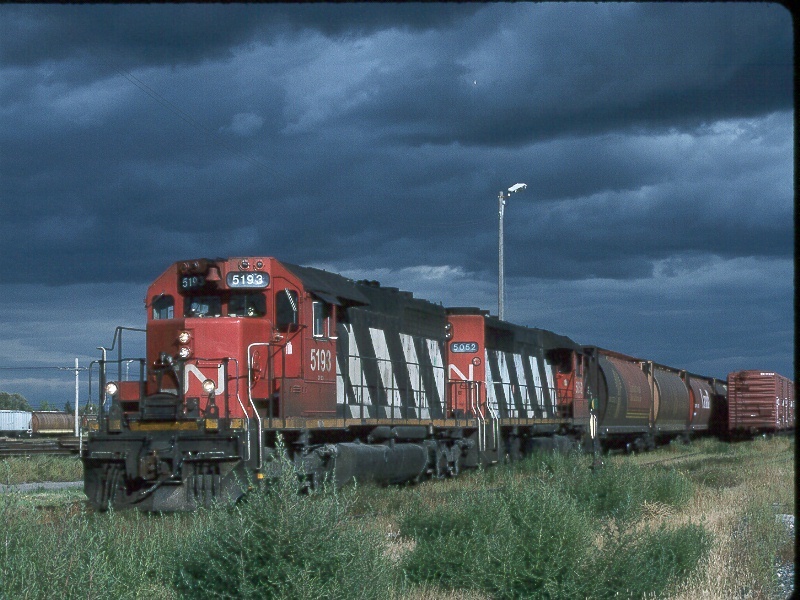 This CNR train was setting off some cars at Portage La Prairie - nice light with the storm clouds in the background. Sept. 17, 1995. 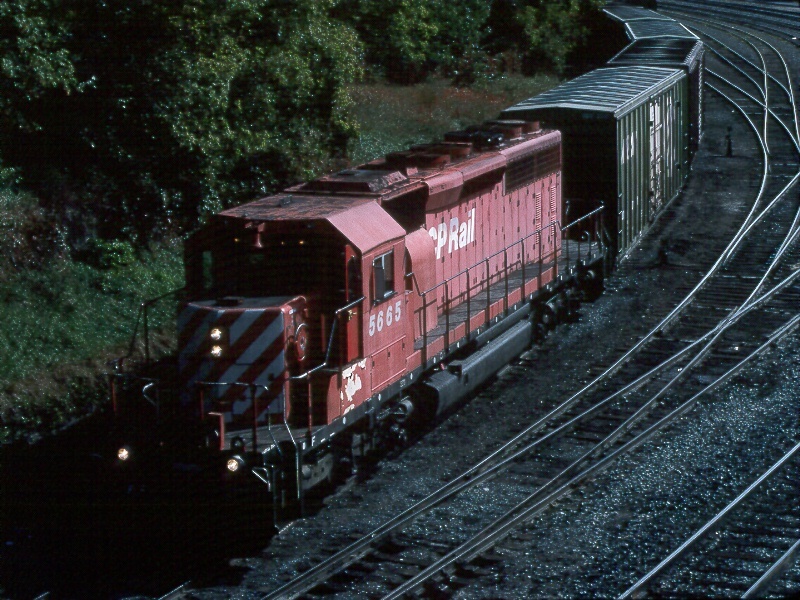 And here is the GMD1 in the sunlight - the first (and so far, last) GMD1 I have ever gotten on film. 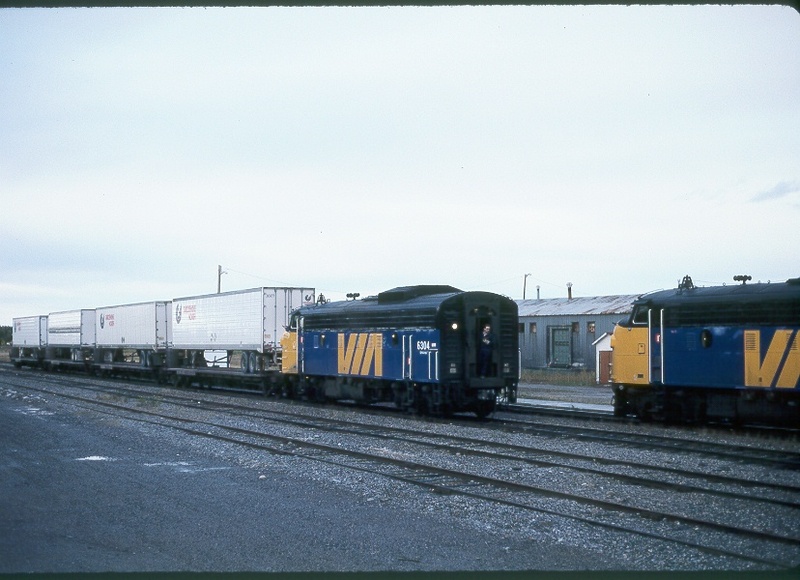 Portage La Prairie, MB on Sept. 17, 1995. 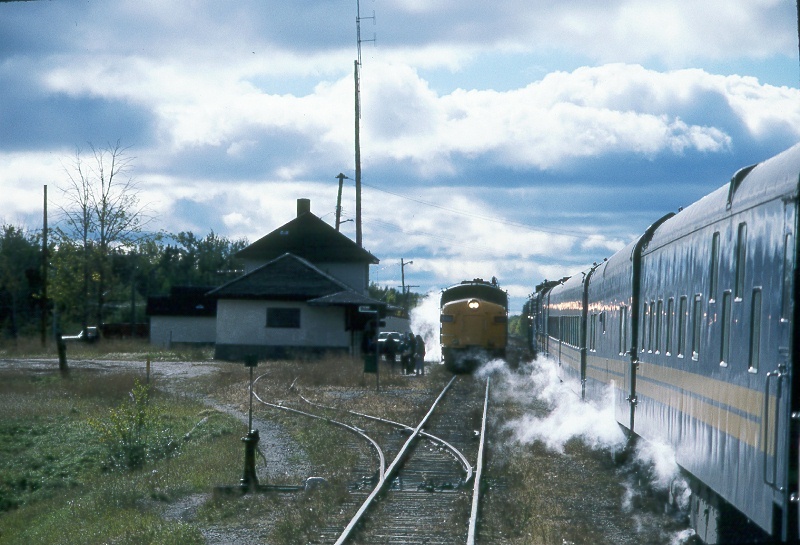 The evening of the 17th we boarded the Hudson Bay train at Portage La Prairie (the only passengers to do so!) and got settled into our accommodations. 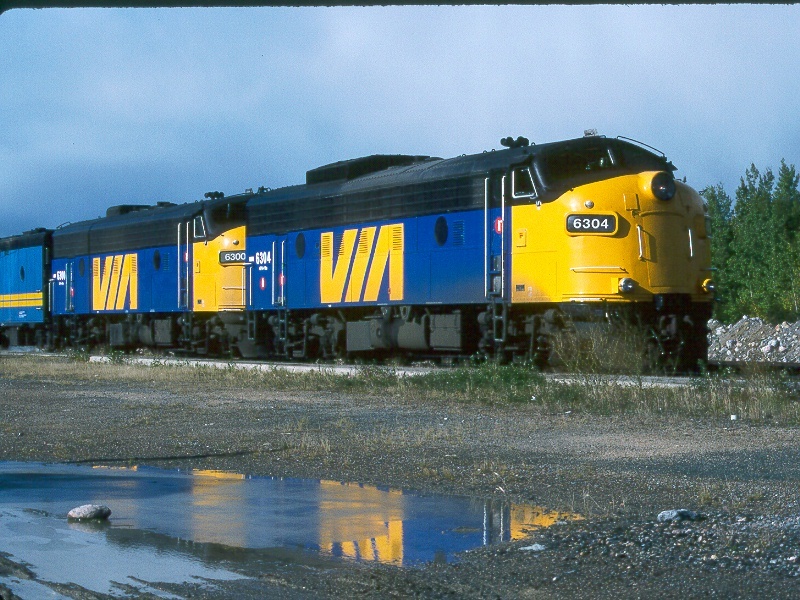 The next day I got this shot of out train at The Pas, Manitoba where we stopped to switch cars. Sept. 18, 1995. The crew cut off the leading unit to do the switching with..we picked up a couple of cars for local travelers. Sept. 18, 1995. 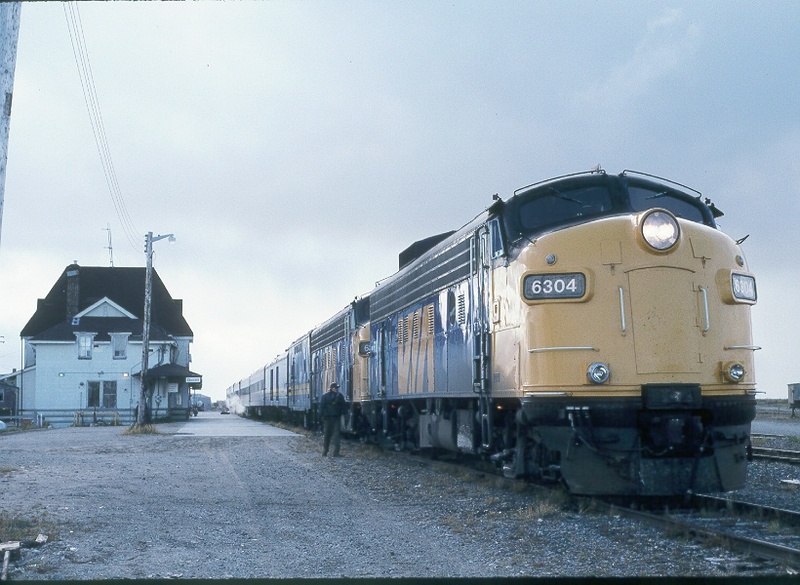 Here we are that evening at Thompson, Manitoba as 4 pig cars are added to our train, making it a mixed train from here to Churchill. 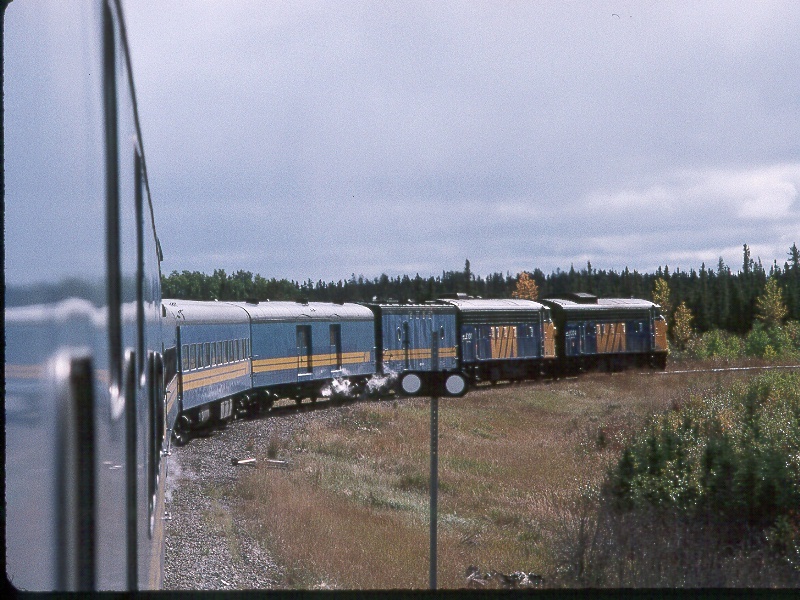 No roads go to Churchill from the outside world, so this train brings in supplies for the town. Sept. 18, 1995. Just before sunset the train is almost back together...the late low sun this far north makes for some nice light... Sept. 18, 1995. The next morning we arrived at Churchill, and had about 12 hours to spend before the train headed back south. 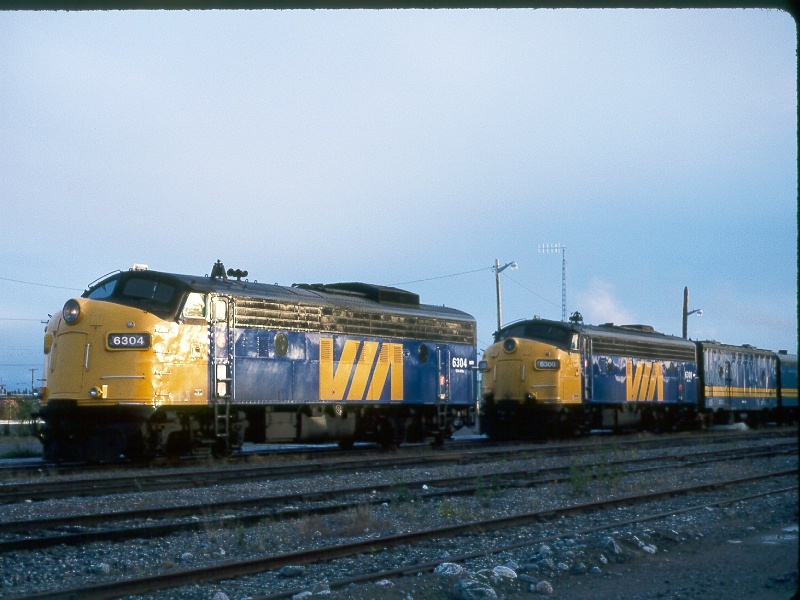 Shown here at the station on Sept. 19, 1995. 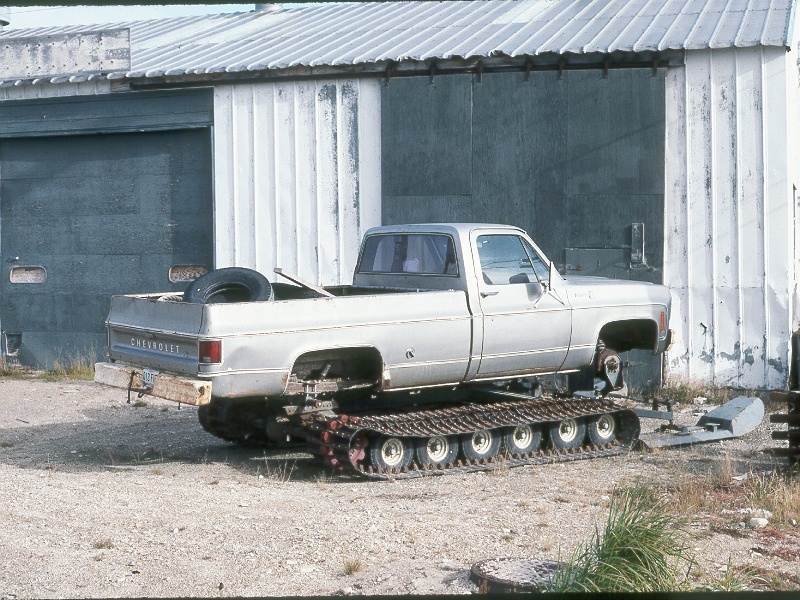 The locals take their snowmachining seriously up here! We took one of the Tundra Buggy tours hoping to see some polar bears, but the guides told us that we were about a month too early for them. But it was good to see the surrounding area anyway...sure is flat up there! Sept. 19, 1995. 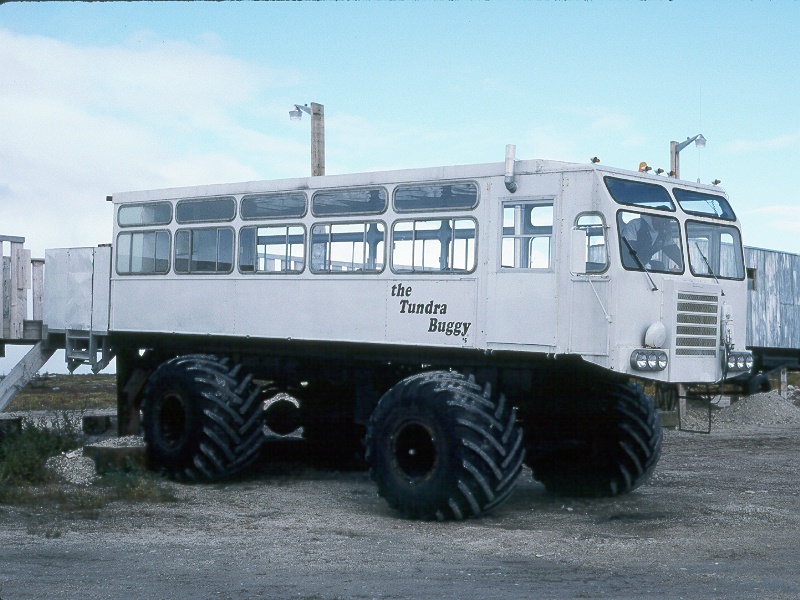 This is one of the Tundra Buggy's used for the polar bear tours. This is on the way back near Thompson. Sept. 20, 1995. The bright early morning sun is lighting up the two F units quite nicely...just a few minutes earlier, it had been snowing! 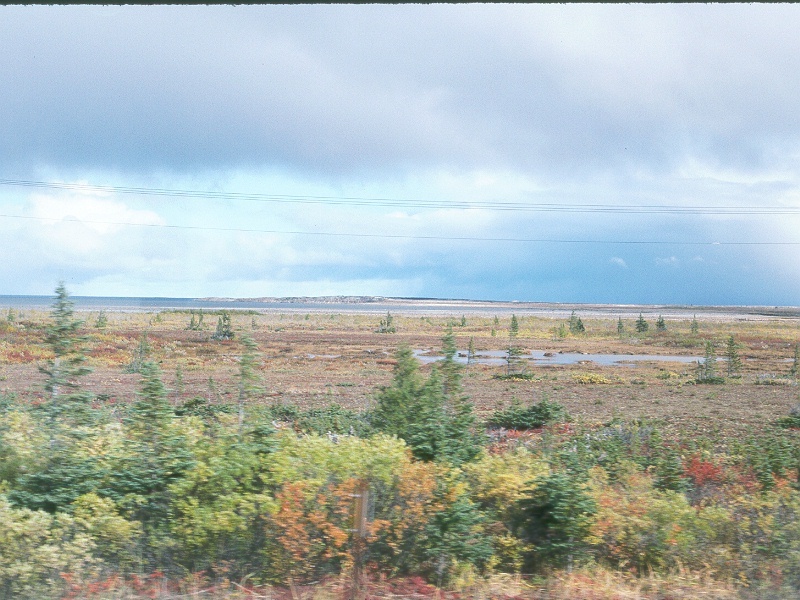 Thompson, Manitoba, Sept. 20, 1995. 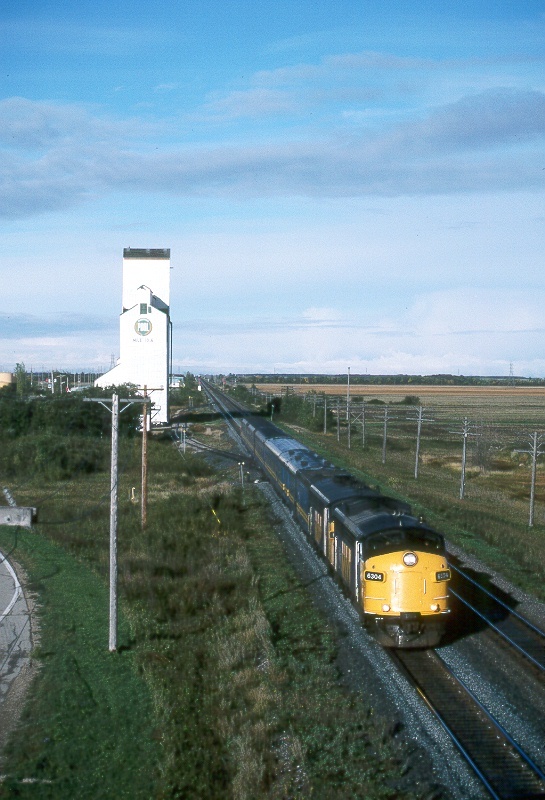 Further south we met the northbound train at Wabowden, Manitoba. Here we are taking the siding to get in the clear, and once the northbound was gone, we backed out and then came down the main to work the station business. Sept. 20, 1995. Early the next morning we got off at Portage La Prairie, and then drove in towards Winnipeg, and got this photo of our train just outside of town. Sept. 21, 1995. We then drove back towards Duluth, Minn. which was a really long day, and we didn't get into Silver Bay (a little ways north of Duluth) until nearly 11 pm. The next morning we were at the "standard photo spot" for the Erie Mining's famous F units on the ore dock at Taconite Harbor, Minn. Here the first train of the day is unloading taconite pellets into the pockets for a 1000 ft ship there. Sept. 22, 1995. We then went up to Tunnel to get the next train...we spent a little too much time taking pictures of the fall colors on the trees, and so missed this train coming out of the tunnel itself. 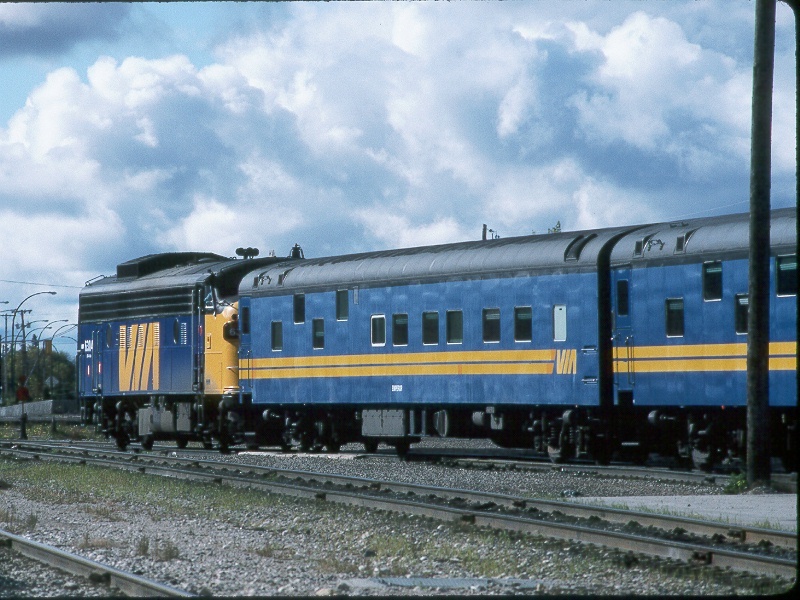 But we walked to the east end of the siding and got some good rosters of the train which was waiting for the morning train shown above to get in the clear. Sept. 22, 1995. 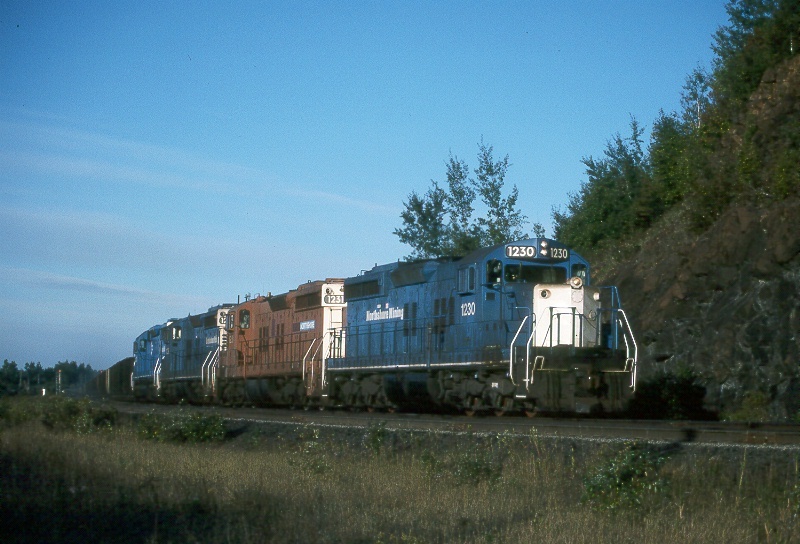 The next day we chased the Northshore Mining Co's trains, which has some interesting power in the form of SD9's, 18's and 26's...and 154 car trains! 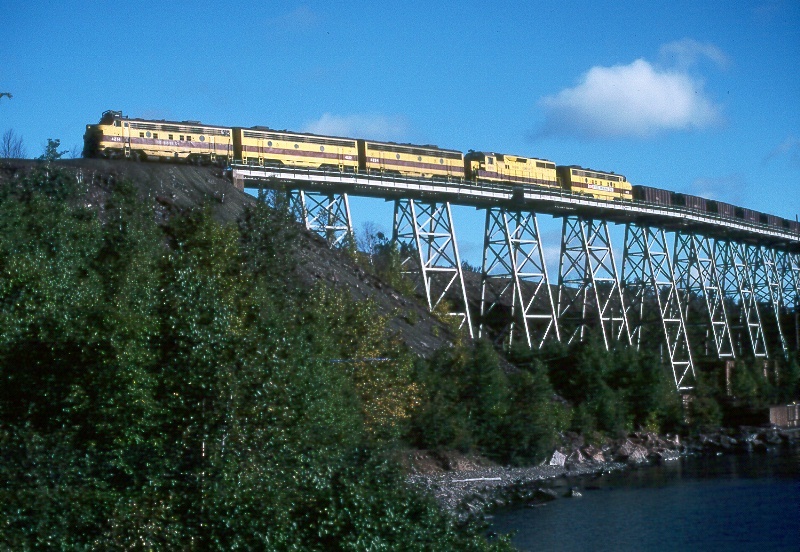 Here is the morning train at Silver Bay headed to the plant with a load of raw taconite. Sept. 23, 1995. 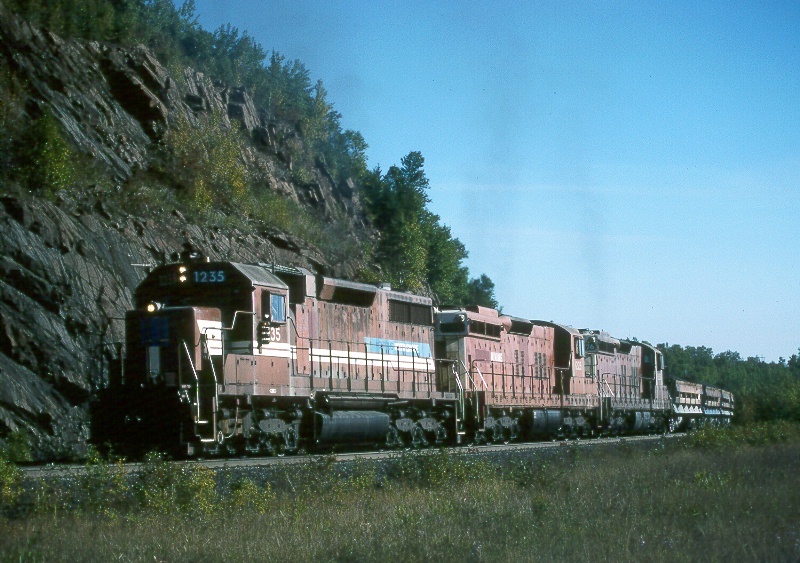 This is the "waste train" hauling spent tailings from the processing plant to a dump about 10 miles inland from the shore of Lake Superior. This train is barely making 10 mph and are in Run 8. 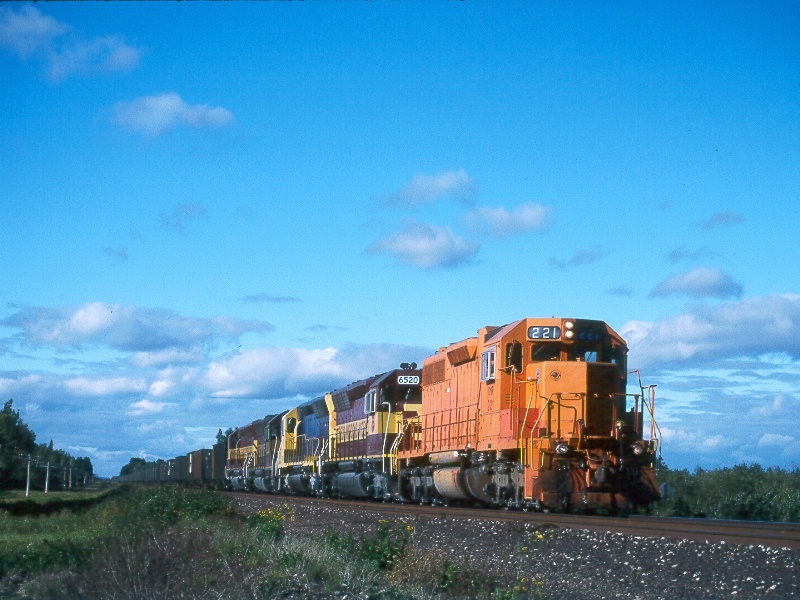 Sept. 23, 1995 near Silver Bay, Minn. 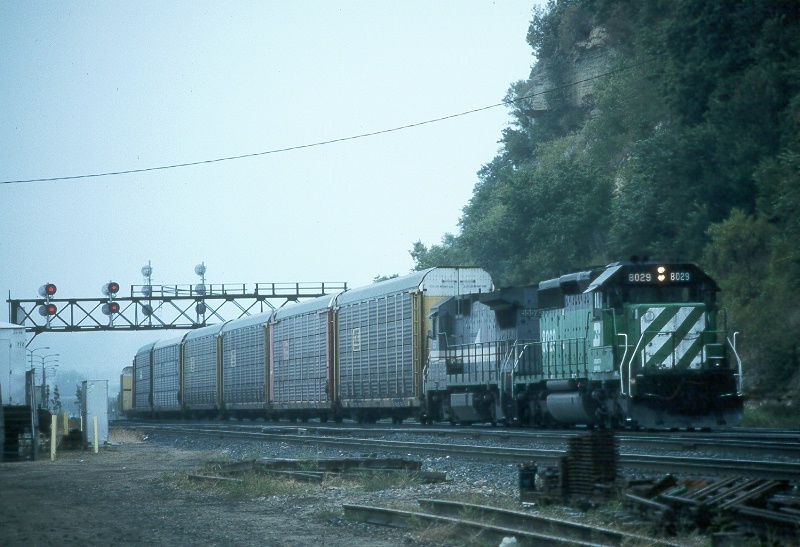 Right behind the above train was this train of empties headed back to the mine some miles inland. Again this train is barely doing 10 mph and in Run 8....quite a treat to hear older power running full throttle! 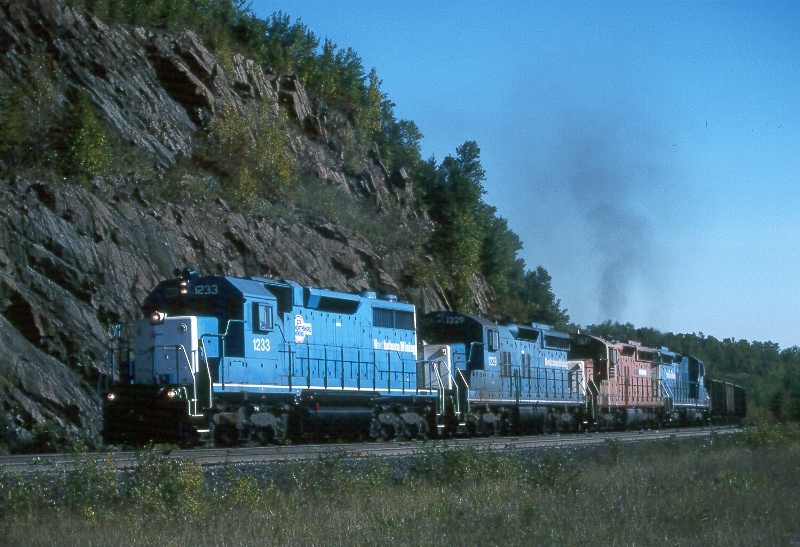 Sept. 23, 1995 at Silver Bay, Minn. The next day was rainy, but it was not a big deal account that was the last day of the trip and the day to fly back here to Arizona. 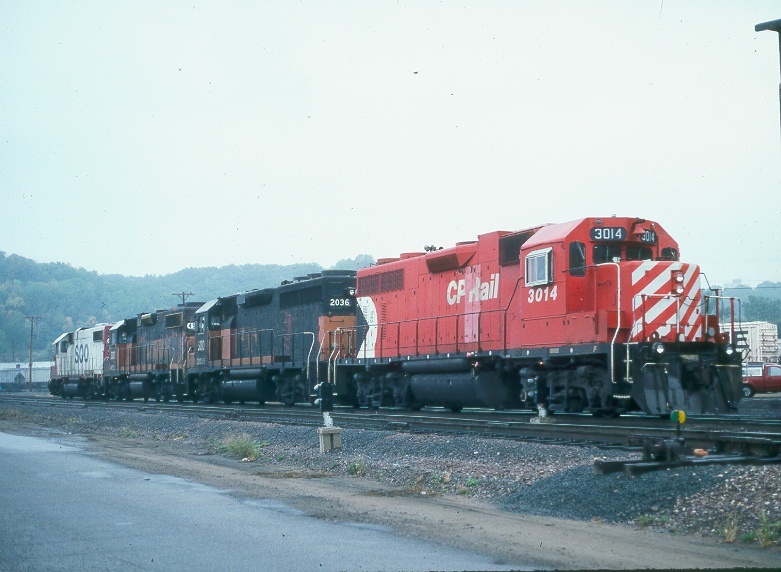 This is a train at Hoffman Avenue in St. Paul, Minn. on Sept. 24, 1995. 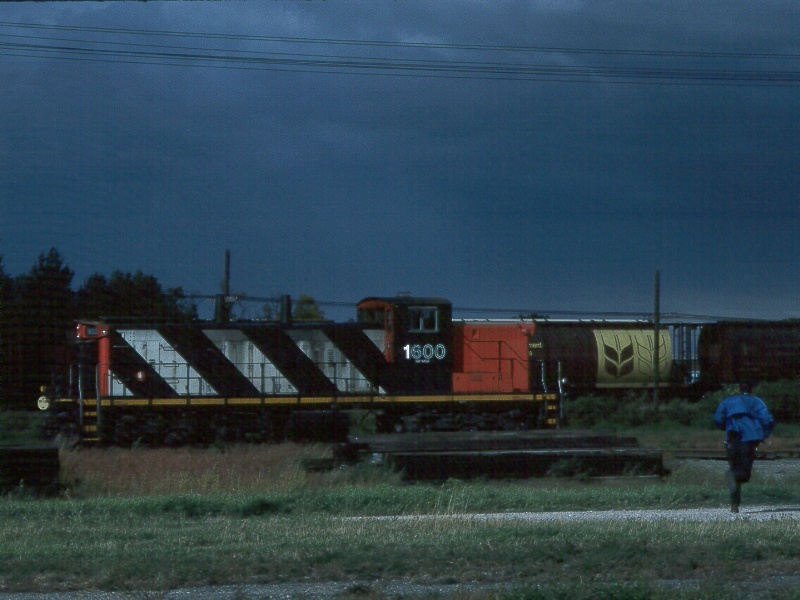 More power in the rain near Hoffman Avenue in St. Paul, Minn. on Sept. 24, 1995. This was one of the best railfan trips I have ever done...a very enjoyable trip and someday I hope to be able to do it again! All Photos on this page copyright ©1999 by Ted Ellis. All Rights Reserved.